Wayfaring Wanderer: Away We Go! The above photo was taken the summer of 07 by Cody! Now, I finally get to go to the NC Coast, too. Namely, the Outer Banks. I am more than excited. It has been a very rough week. I need a break. Beautiful! So inviting and peaceful. What a great photo! That reminds me of those motivational posters. Love the brilliant blue! you're gonna love the NC coast...share more pics, OK?? How beautiful! I love the sun coming through the clouds! Great photo, I wish I was sitting on that beach. With a picture like that, less is more. Oh water is so soother and rejuvinating. Enjoy! What a FABULOUS shot! Wow! If that picture isn't framed and hung on your wall, I'm going to have to come do it for you! -- Don't think I won't! 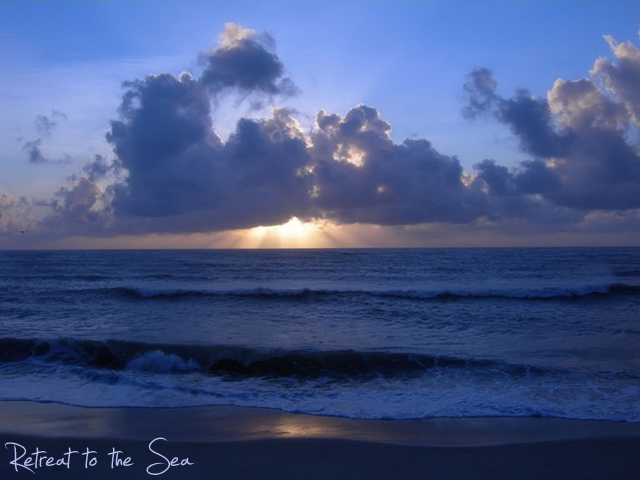 awesome picture~the outer banks is our most fav place to go! Enjoy your trip to NC!! one of my favorite spots and where I want to retire. The outer banks..., I'd love to go there..., what a beautiful shot. Isn't North Carolina great? It's hard to imagine a place so different from Boone than the outer banks. Eat some seafood for us. I've heard the Outer Banks are just lovely. Hope you have a wonderful time! Great shot! I've seen this before in Key West, FL. Enjoy your break...you deserve it. YOU have a nice weekend! Great shot by Cody. Fantastic shot! Enjoy your Outer Banks break. I have a favorite coffee mug that says "I go to the sea to breathe." It is so true. hoping that you find all the air and space and rest that you need. Beautiful photo and haiku. I tried a haiku in this weeks post, um ya not as lovely as yours, lol. That's a beautiful sight. You can only come back feeling peaceful and light. Enjoy your time away! So makes me long to head out to the beach too. Marvelous picture! i am always jealous of anyone being near the coast of anything. waves, my favourite. If you are going to the outerbanks just get into a boat and pop over to the U.K. You both enjoy your break. POD.